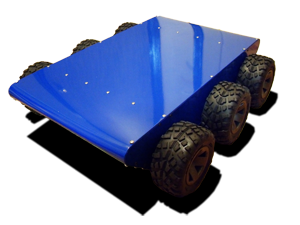 My new 6-wheeled robot platform provides a good starting point to mount an array of sensors. Though I also plan to use this base to experiment with autonomous robotic behavior, my first plan is to add a web-cam and wireless network and be able to control the robot with my iphone! The goal with the iphone is to develop as natural as possible user interface and one very unlike traditional control interfaces. I like the idea of controlling a mobile robot with an iphone by using the iphone's accelerometers and digital compass rather than a traditional interface using buttons. The accelerometers add a more natural control interface where movement of the robot and the panning camera is controlled by moving the iphone by changing yaw, pitch and roll. The iphone, and similar emerging devices, are changing the way we interact with the traditionally flat digital realm and instead augmenting reality --- yes, wiki Augmented Reality!